I can barely type this post without tears streaming down my face. Four years ago yesterday, I woke up after a night full of contracts and questioning if my “water” was still intact and went to work anyway. A quick visit to the doctor to make sure meant we were headed directly to the hospital, 2 weeks before my due date, and 6 days before our scheduled induction date. 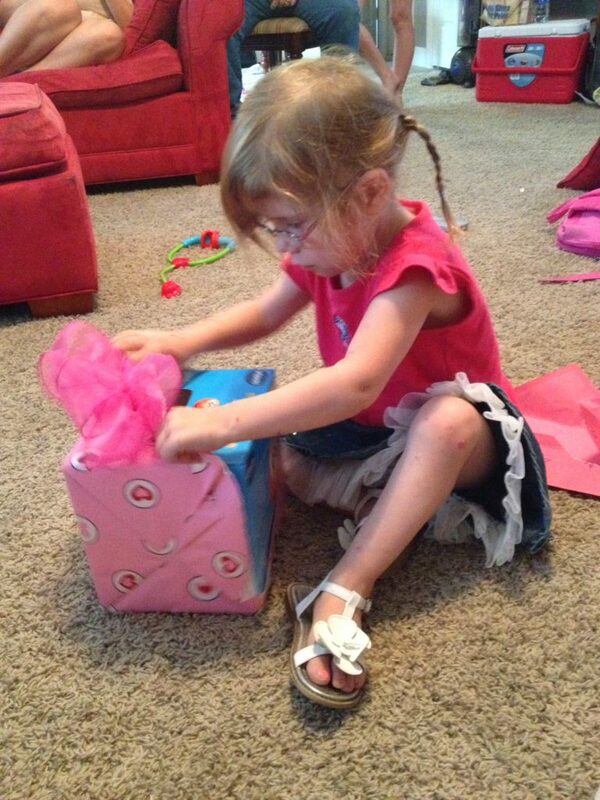 At 11:15 pm, July 20, 2010, my 4th princess was born. It was a day I’d anticipated but feared. At the time, I had no clue if yesterday would ever come. If I’d ever be able to see my daughter’s first week, first month, first year, much less a 4th birthday. They worked on her for a few minutes, as she was much bluer than they wanted. Finally, they got her breathing well enough to put her against my cheek for a too-short kiss, then whisked her to the neighboring Children’s hospitals. Hours later, even though it felt like days, I was finally able to make the journey across the walkway to see my sweet baby girl. 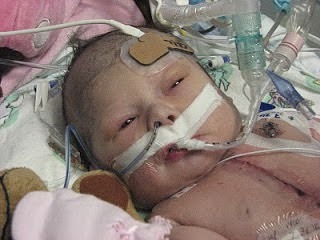 She was hooked up to all sorts of foreign tubes and wires, but despite it all, she was my beautiful little girl. 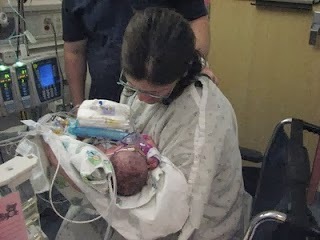 7/21/2010 — my first time holding my baby!! At first, they didn’t let me hold her. Hindsight, I would have demanded it. She wasn’t hooked to a ventilator. Really, there was no good reason I couldn’t hold her. I know that know, but I was so green, so scared. We were told to expect a 4 to 8 week hospital stay. That was the norm. She had a 80% survival rate for that first surgery. An 80% chance of going home. 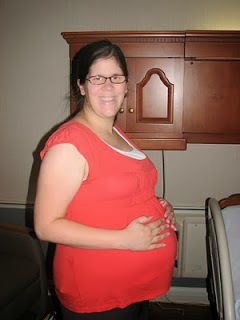 Never in a million years, however, would we have anticipated staying in the hospital for ten long months. Oh yes. I remember that day, July 20, 2010. I’ve quoted the number probably no less than 1,000 times (and perhaps double/triple that) to doctors/nurses/receptionists during med check, appointment check in, and calling in with a question. My life changed with the birth of each of my children. As all Momma’s know, it’s just a fact. Your life is more enriched, more beautiful, more full, with your child snuggled in your arms. You can’t help but change. But Annabelle’s birth changed me on a different level. It challenged me. It broke me. It brought me to the lowest moments of my life, made me face my worst fears. and less than a day before she crashed and almost died. The day I gave my life to Jesus made me a new creation in CHRIST. But the day Annabelle was born, I started the journey to understand exactly what it means to rely completely on the creator of the Universe. It’s not about me though, even as much as God changed me. 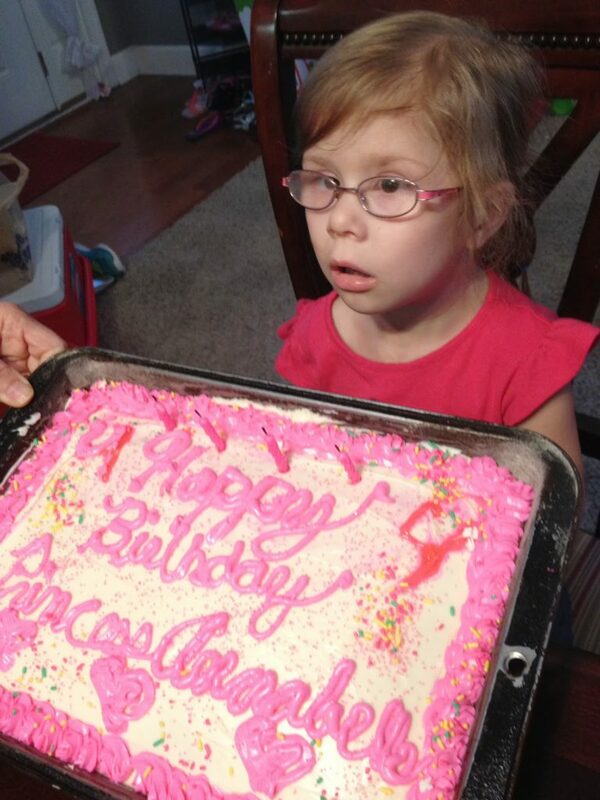 Annabelle’s birthday is a day to celebrate a life God saw fit to save. 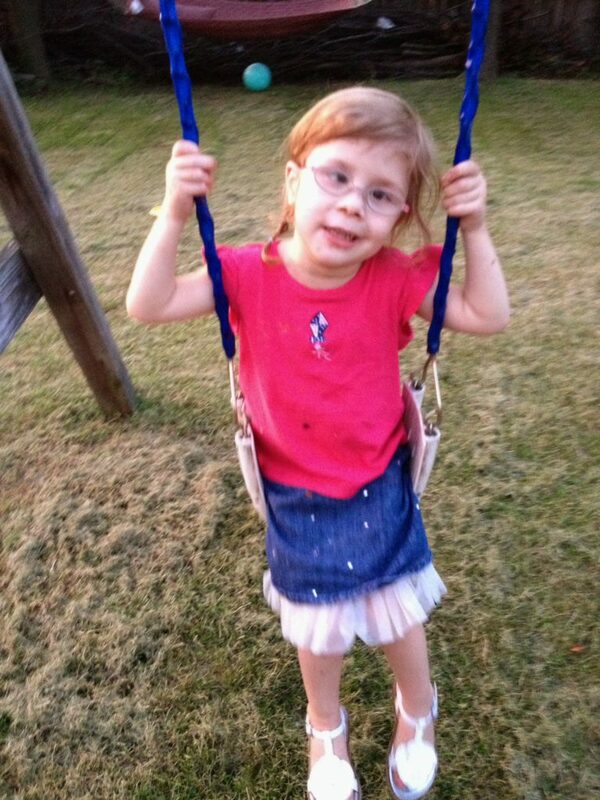 A sweet little princess whom God loves, who has endured more pain in her short 4 years of life than I probably ever will in in all my years combined. Who laughs and giggles, even when she’s sick. Who does cute things like yell at the door, saying “SHUT uh DOOR” then shuts the door and tells herself “hankwho” (aka thank you) Who tells everyone ELSE “happy birdday” on her own birthday. Who has lots to learn and still lots to catch up on, but has defied the odds and risen above her challenges. I have no doubt that Jesus was with her in spirit the whole entire way. Cheering her on. Giving her strength, Wrapping her in his arms when she got tired. Oh my sweet Annabelle. I fail you every single day. I know that. I fall very short on the “mother” meter as to what you need, but oh goodness. You thrive anyway. You love me anyway. You, my dear, are my sweet princess, and I’m so thankful for every single minute God has gifted you to us. I have no idea what all God has in store for your life. I tend to live it one day or week at a time with you. But I know whatever it is, it will be great. It will bring HIM glory. And oh sweetie. Mommy prays that you come to the amazing knowledge that Christ isn’t only your physical healer, but your Savior as well. 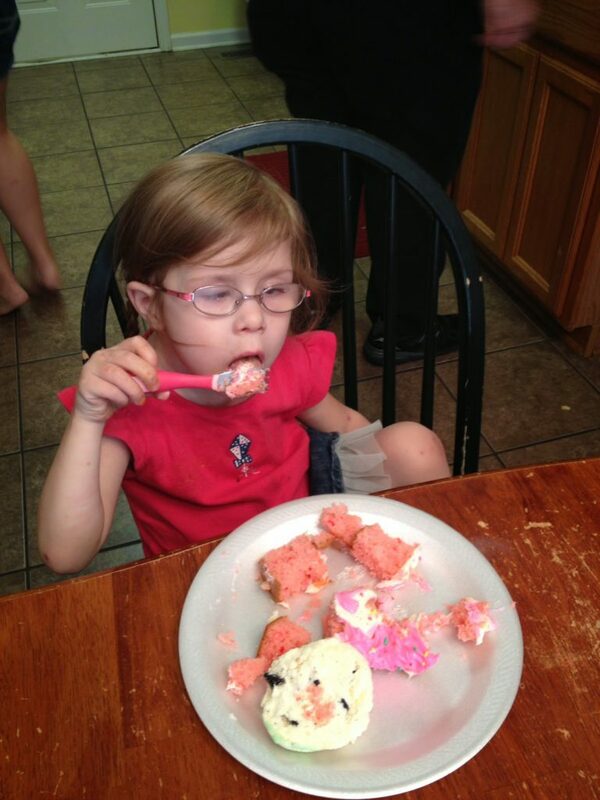 So, Happy Birthday (one day late) my sweet baby girl. 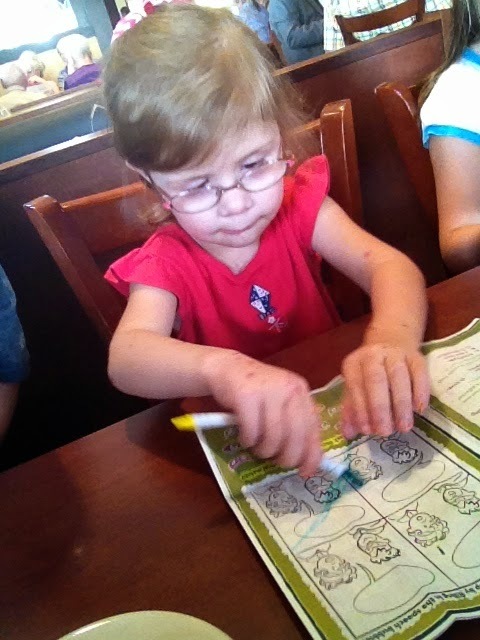 She’s come a long way…..
Coloring at birthday lunch is super serious business! Look, I can break a crayon!! 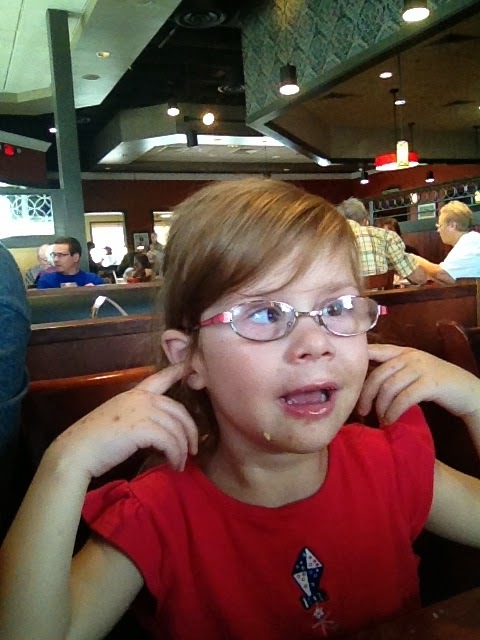 I can’t hear you…. la la la la la! She REALLY got into present unwrapping for the first time this year!! 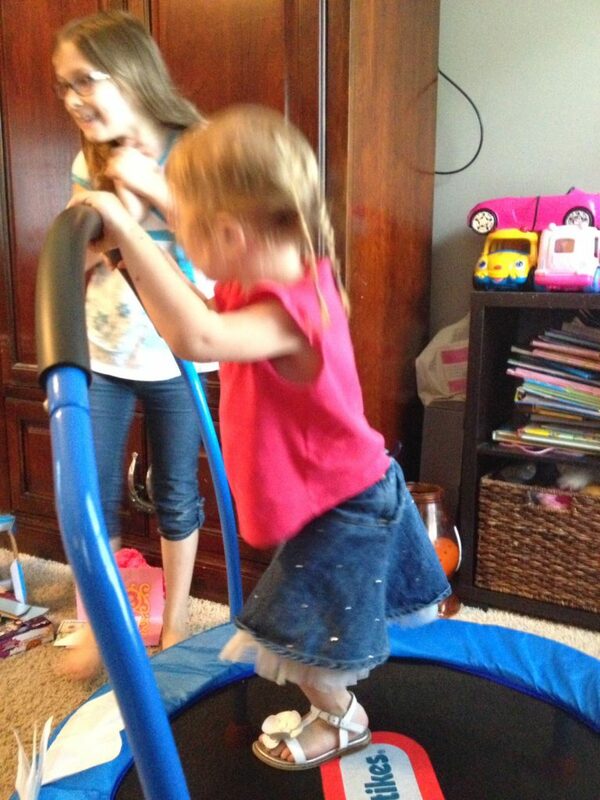 Her “big” present… that is also good therapy to build her leg muscles! She was a little nervous at first, but all my pictures blurred because she was trying to jump to try it out! SO cute! THIS is how you celebrate a birthday! 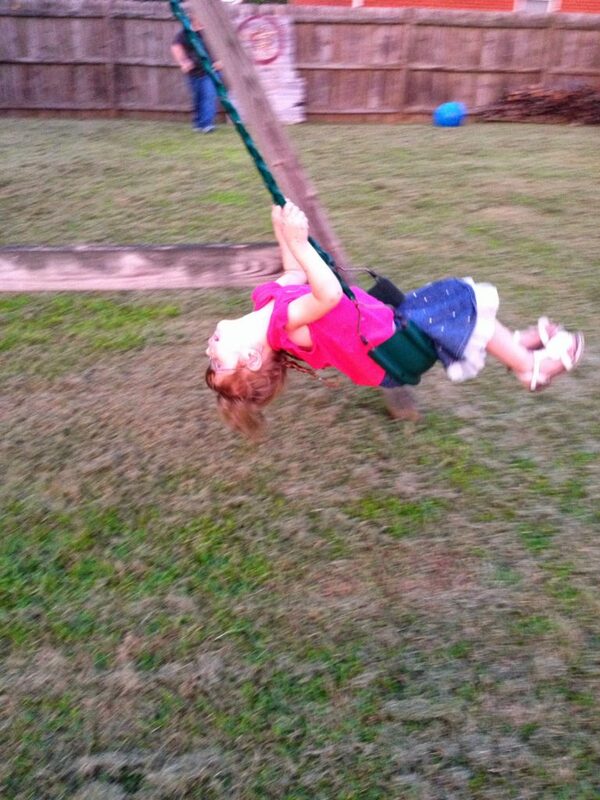 My carefree little girl!!!!! Even opening cards can be super fun!!! 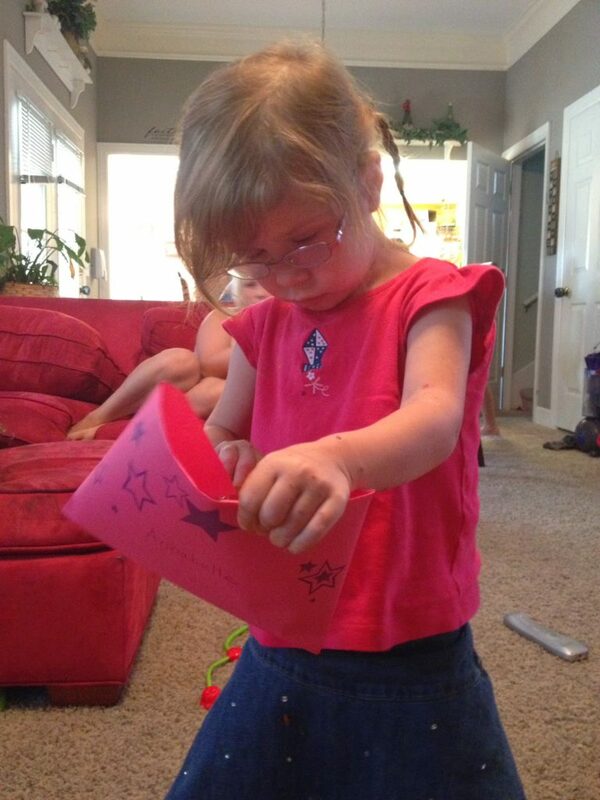 One last present from grandma and grandpa…. 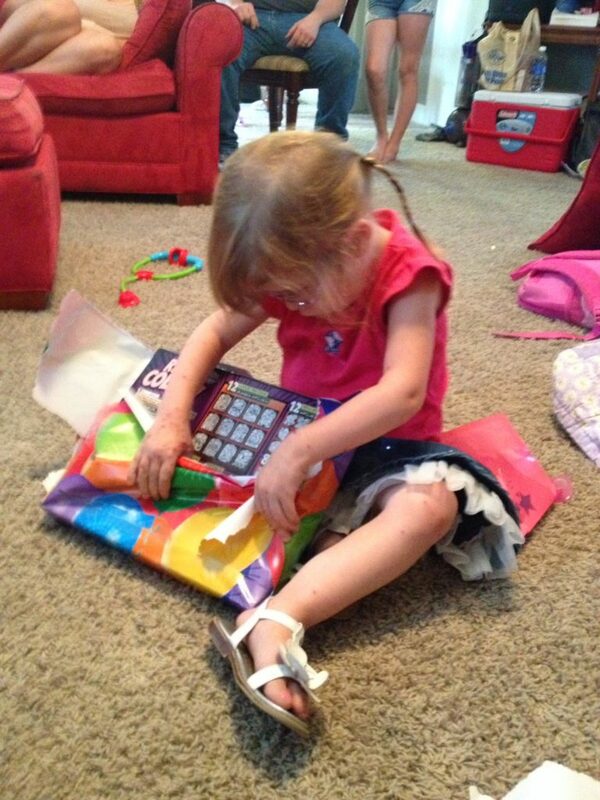 she had one good birthday!! She was literally saying “cheeesee!! 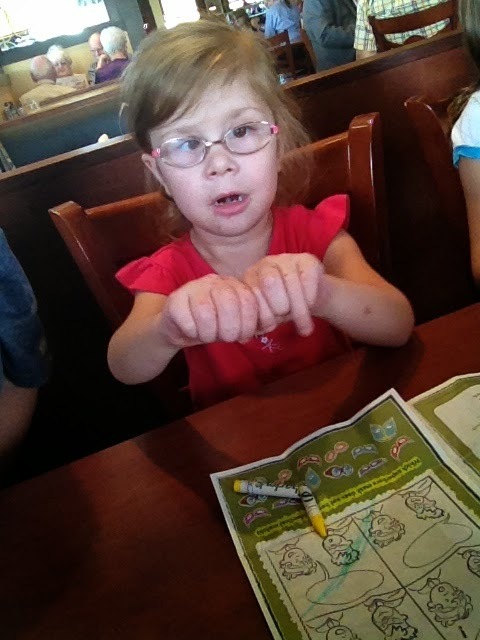 !” My big 4 year old girl now!!!!!! Looking at her first photos and how she is now … I'm so grateful she doing so well. Thanks, Riete!! I'm so grateful for all those who have prayed for her these last four years! Words cannot express what it has meant to me!!! A lovely post. Precious mother, precious daughter. Thank you for sharing your journey.